Wednesday at 6:00 at the Honan Library is the first public meeting about the State's planned project improve the Western Ave and River St bridges. The great people at LivableStreets have created this handout that suggests some key points to consider making if you attend the meeting. Harvard Real Estate Allston (for Mahoney's Garden Center) - 449-451 Western Ave - Remove and replace three sides to existing greenhouse and erect a 15,750 square foot addition to building. I don't think anyone knows with certainty how and when Harvard will move forward in Allston, but here's one opinion from someone with enough knowledge to make a career decision based on it. Based on her estimate and that, at 43 years old, she probably has 20+ years left in her professional lifetime, it could be 2030 before Allston sees any Harvard art. With the plans for Harvard’s new contemporary art museum in Allston currently up in the air, Harvard Art Museum’s curator of contemporary art Helen Molesworth will leave Harvard to become the chief curator at the Institute of Contemporary Art in Boston, ICA officials announced earlier this month. “It’s become clear that the University has a very, very long-term plan for Allston. It won’t happen in my professional lifetime,” she said. Thanks to Adam Gaffin for being the only source I know of to regularly cover news of the Boston City Council. "Benzan’s name will join a slew of other contenders vying for the post, such as Charlestown lawyer Dan Hill, Cambridge lawyer Tim Flaherty, Cambridge City Councilor Marjorie Decker, son of former state Sen. Sal Albano of Somerville Michael Albano, and former Galluccio chief of staff/ Everett City Councilor Sal DiDomenico"
Over the past few years, those of us who attended Harvard Master Plan and related meetings were told about an Urban Ring bus rapid transit system would be a major piece of the transportation system that would move thousands of people a day between Harvard Sq, Allston, Longwood, and elsewhere. "But maybe the biggest hope for Urban Ring supporters is this: Harvard University wants in, and if there is one institution that has the big money needed to make things happen in these parts, it's Harvard. With its plans to expand into Allston, Harvard has proposed a new stop, called West Station, on the existing commuter rail line in Allston and would like to reconfigure old Urban Ring plans to have Allston, and West Station, included." "MassDOT's current financial condition prevents it from building the Project in its entirety in the foreseeable future - and the MBTA's current financial condition makes it financially unable to operate it"
Bring friends and family to watch the DreamWorks animated movie “Monsters vs. Aliens” shown in Blu-Ray. Enjoy some popcorn and good company and watch as an eclectic and entertaining group of monsters combat a group of aliens to save the world from destruction. Today's Supreme Court decision threatens to open the floodgate for more money to pour into the accounts of the representatives who should represent the interests of the citizens in their districts. Please watch this video and support the important work of Change Congress. 1304-1312 Commonwealth Ave - Replace eight foot chain link fence with a new ten foot plastic fence. Interesting that two Harvard vice-presidents are quoted in this Harvard Gazette story about ice skating in the old VW dealer on Western Ave. Is Allston so prominent these days on the administration's radar screen? The MassDOT Highway Division is hosting a meeting about the reconstruction of the River Street and Western Avenue bridges. We all know these bridges and the areas around them are overwhelmed with auto traffic and horrible for bicyclists and pedestrians. Hopefully the strong advocacy of our community and others can encourage the major re-design that is needed. The Harvard Crimson reports on some optimistic and pessimistic views on what might happen with Harvard & Allston. Such as photogenic neighborhood! The Best Boston Globe photos of 2009 has 15 photos and two of them are from Allston - Brighton Ave and Harvard Stadium. A reminder from the Globe editorial this morning that even when a university master plan looks good it is the results, not just the plan, that really matters. "In 2006, [Northeastern University] secured approval from the Boston Redevelopment Authority to build three new dormitories with the capacity to house a total of 2,800 students. But the university made good on building just one of those dorms for 1,200 students. Architectural plans for the 600-student dorm on St. Botolph Street are gathering dust. And a proposed dorm on the site of a Gainsborough Street garage is on indefinite hold." Petco Unleashed has signed a lease to open a store in the new building at 226 Harvard Ave. Can't imagine how this can be good news for Jim Gentile's Pet Shop just a block away. It is a special day when there is something good to say about something happening on Western Ave, and I am glad that today is one of those days. Mahoney's Garden Center, which has been a generous friend to our community, is almost finished demolishing the small building on Soldiers Field Road behind the Mahoney's store. 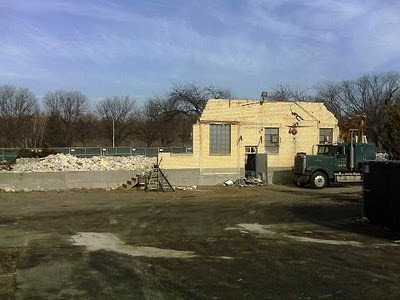 This demolition will make Mahoney's much more visible and accessible to Soldiers Field Road and will allow them to greatly increase their selection. To Harvard's credit, they have found a good use for one of their empty buildings. 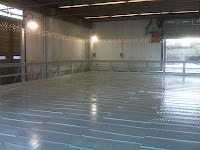 During the next few months, the former Volkswagen dealer on Western Ave (next door to Flint Cleaners) is being transformed into an indoor skating rink. The Mayor is coming to cut the ribbon on Friday, and more information and hours of operation are available here. Tracy Jan (tjan@globe.com) at the Globe is Seeking your ideas for Harvard's Allston property for a future story. "FIREARM DISCHARGE: 89 Faneuil St in Brighton, SWAT Team discharged at pit bull while conducting search warrant for armed robbery suspect." Nice story about BU Sociology Professor Daniel Monti and InnerCity Entrepreneurs helping small business owners in and around Boston grow their companies. WCVB hopes for "constructive action by Harvard"
Nice to see WCVB Channel 5 joining us in hoping that 2010 brings something better to North Allston and North Brighton than 2009 did. 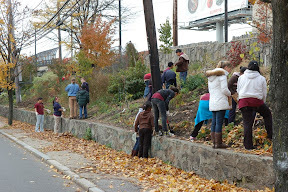 During the last couple years, the ABNNF has planted trees, shrubs, groundcover, bulbs, and more on the Everett St slope and at the Gardner School playground. While these plants are hibernating under a blanket of snow, it is time to apply for grants and plan projects for the new year. Where in our neighborhood do you think we should continue with similar projects? Please leave your suggestions as comments to this post. "State Senator Anthony D. Galluccio today was found in violation of the terms of his probation and was sentenced to one year in the Middlesex House of Correction. He was led out of the courtroom in handcuffs." Harvard Professor Ed Glaeser writes in today's Globe that "Transparency is the cure for those fifth-term blues" and that the Boston About Results website "is a significant Menino innovation that provides easy-to-use data about city services". I've written in the past about the impressive scorecards used in New York City to measure how well NYC does things like keep the streets clean, so after reading Glaeser's op-ed I took a look at the Boston About Results website to see the reports that the City is publishing for each department. Honestly, I don't see much "big innovation" over at Boston About Results. When I think about the results that I hope we are getting from the School Department, Public Works, Transportation, and Inspectional Services, it is mostly about how much our kids are learning and quality of life issues about street cleanliness and snow shoveling, potholes, and rats. Glaeser writes that "when I checked “Boston About Results,’’ the link to the education performance page was broken". I am surprised that in the 16 or so hours since the story went on-line nobody has bothered to fix this link that is supposed to provide the "FY09 Annual Performance Report" for Boston Public Schools but instead reports that "Sorry, you have reached a nonexistent page on the City of Boston's webserver." For departments whose links do work, I don't see much that tells the voters, citizens, and taxpayers of Boston about the results that we are getting from our City government. "Big Innovation" might be the ability to enter a zip code, ward/precinct, or street address, and get relevant information about "results" that are local to your home or business. Instead, Boston About Results gives only citywide data. I thought it was admirable when Boston announced a goal to plant 100,000 street trees by 2020, but the Parks Department report doesn't tell much about our progress towards that goal. Sixty trees were planted between July 1, 2009 and September 30, 2009. The goal for this period was zero. What does that mean? Was there some emergency that necessitated planting trees when the City planned to plant none? Where in the City were they planted or how many of them were planted in Allston and Brighton? The PDF doesn't tell us. Are we on track to meet the 2020 goal? How clean and safe are Smith Field and Ringer Park? Do you see "Big Innovation" in these reports that I am missing? (Admittedly I didn't have the time today to review every report in detail). On November 18, the Massachusetts House and Senate unanimously passed bill #4356 to lease State property on Western Ave to the Joseph M. Smith Community Health Center "for construction of a new community health center building of approximately 40,000 square feet and related parking" for the next 50 years for $1. "The needs of this valued community center to expand must be balanced against the needs of the Commonwealth, including protecting the public fisc. Requiring the state to lease extremely valuable property for $1.00 per year does not strike that balance. Accordingly, I am returning this bill for amendment to avoid any violations of the anti-aid amendment and to provide a fiscally responsible transaction." Next this new amendment will go to the Senate and then possibly back to the Governor.